It is always good to hear from Customers and their stories of how they enjoy our parts here at Carpy;s Cafe Racers, none less than this fella, William Lundy. He purchased one of our performance 4 into 1 exhaust systems and simply jetted and off he went, he raced his little 550 with some of the big boys. So- I thought I would share with you, some of the email that he sent to me today, I am so stoked that he likes what we sell here at the shop and I knew he would be happy. So to start the exhaust really does rule. It all started when I got this quite large package at my door step and unboxed the glory that is the Carpy Exhaust. I immediately went about coating it with black ceramic spray from my local auto parts store. not the best option I know but I was under a tight budget. After the coating dried I began to fit the new exhaust. I was immediately impressed with good the welds were and the one piece design. once I got the old pipes off(4into2 no baffling) I slid the new part into place with ease. everything fit extremely well and I had the exhaust on and ready to go in a matter of about 15 minutes. So i started my bike up and immediately noticed all four pipes were leaking. Stupid me forgot to throw in new exhaust gaskets. So off came the pipes and around another 20 minutes later i had a monster exhaust setup. my bike…the be completely honest is a real snotter. It looks like a turd and is beat up as anything. But…beneath the rugged exterior lies the monster. I am running a completely stock engine minus the cam chain tensioner and complete lack of electric or kick start. Also running stock carbs. With my carbs I had to play a little with the jetting. I found that for the bike and fuel that I use (sunoco 110-the purple stuff) i was running a little higher jetting than most and with a stock airbox. Not because I chose to keep it but because of budget. It is thrift shop racing team after all. The bike runs just a bit rich with normal pump gas but with the racing fuel it is spot on. once I had the jetting right for my setup it came to the choice of to keep the baffling or to not. i had already noticed an increase in my bottom end due to now having some back pressure on the motor and was really torn on what to do with the baffling. so what i did was simple. went to the local back road and broke it loose. I could scream at top end with the baffle out but i lacked the power to launch out of the corner. most likely due to my stock airbox. but with the baffle in I had the bottom end I was looking for and a pretty tip top upper end. I wasn’t so worried about top speed in reality though due to most of the track around here not having enough room to really get the bike all the way through the gears. 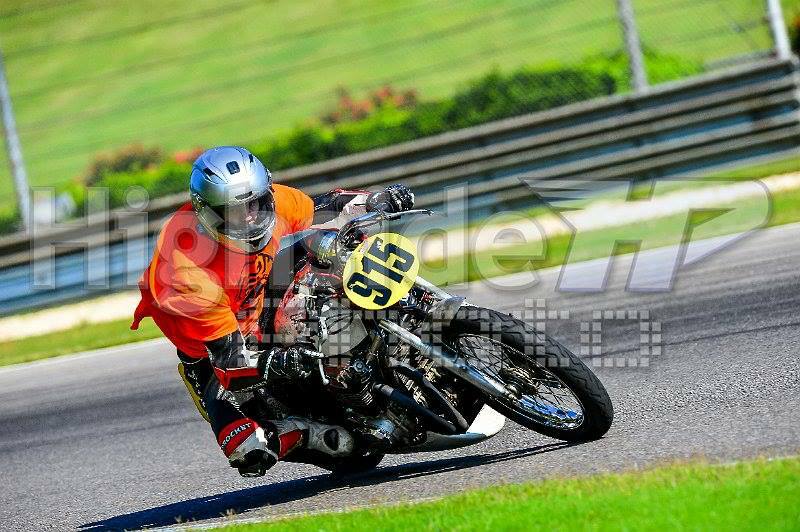 So once I had it all sorted I fit my belly pan around the exhaust, safety wired the bits and was off to the first race of my career and best track on the east Barber Motorsports Park with the WERA sportsman series. Being as this was my first race i was forced to attend race school which was extremely informative and helpful. After some simple instruction we were set to hit the track for a practice run. I donned my suit and lined up ready to go. As I screamed through the first couple of corners it was apparent that the old bird still had some fight. I was ahead of a 1999 gsxr-750 and pulling into the corner. After exiting the museum corner and heading onto the back straight disaster struck and I had smoke and small flames coming from my ignition switch. a wire had come down and hit my motor exposing the metal inside and shorting out my system,popping the fuse and sent me back to the pits on the crash truck. Thankfully my great pit crew consisting of David Hurst and Charles Gault both riding RD yamaha’s got me fixed up while I was in class and had me ready for the next practice. The rest of the day went great and I was dropping seconds like crazy on my lap times. The next day was race day. 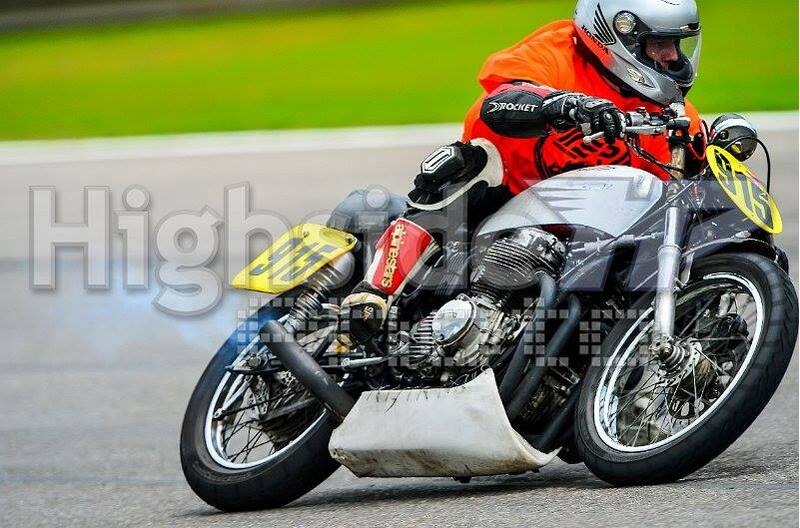 I was set to compete in the clubman class due to it being a non vintage race day and that being the only class I would fit in without getting destroyed by modern bikes. As I pulled up for practice I see my competition. A bunch of 250 ninjas and cbr’s that I knew were brand new and highly tuned. my only chance was to hang back and see what lines these guys were running. After practice I was pretty certain that my only chance to get these guys was my ability to blast out of a corner and pull them on a straight. 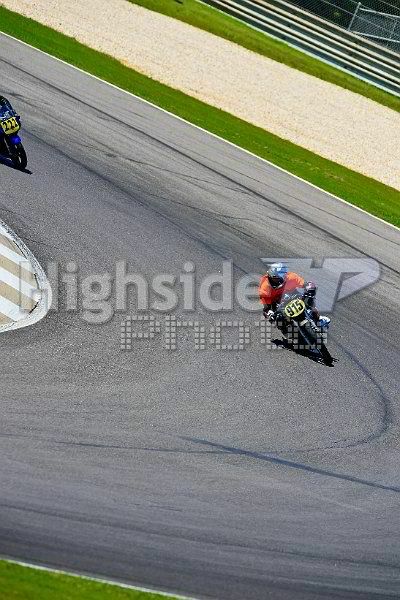 so when it came time to race I had two goals, Don’t be last, and try to run up front through the first couple corners. I was gridded dead last due to points and was ready to go. the flag went up and I shot off the line like a bat outta hell leaving a thin black line and my tire about three inches off the ground nearly all the way into turn one. Ahead of everyone. As i was breaking into turn five i didnt’t see anyone near me and I went about my business, looking through the fence upon exit to see that the pack was just now making it into five. the rest is history. I twisted it up and never let up leading the races to a win by 8 seconds. The bike had seen better days and there wasn’t an engine part of foot peg that wasn’t ground to a powder or throwing sparks. But the exhaust is what really shined. the crowd from the paddock said you could hear me coming through the trees at turn 17 a thundering roar followed by a modest hum of the competitors as The bike meandered sideways onto the straight away. After each of my practice runs and races I was sure to get a few guys either modern bike riders or vintage fellows scooting over to my pit on their pit bikes to see just what was so darn awesome about the ride. I heard nothing but great remarks about the sound and performance. I was told the exhaust sounded like “the hounds of hell screaming in your ear waiting for you to mess up” from a guy I was “hounding through a few corners before a pass. Everyone got a napkin with the site…. carpyscaferacers.com -carpy exhaust, written on it. I hope you enjoyed the tale of the race and i will attach some photos and give you updates as the season progresses. now it’s time to find new pegs and a charger cover for a replacement! 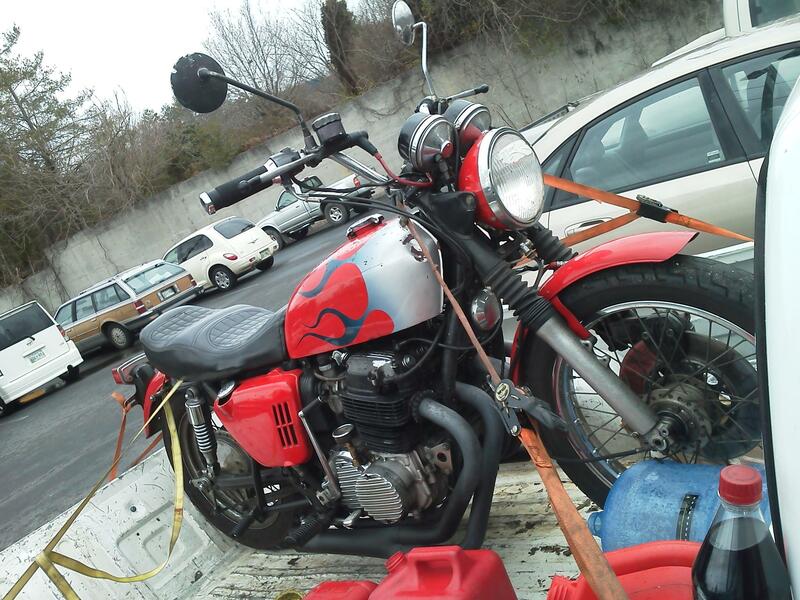 This entry was posted in Blog and tagged 1975, 1976, 1977, 1978, 4 into1 exhaust, cafe racer, CB500, cb550, classic racer, Honda, racer, super sport, yoshimura.